SAN MATEO, CA—Spanning the region between San Francisco and the Silicon Valley, the San Mateo County Community College District (SMCCD) serves more than 40,000 students. Three campuses, the College of San Mateo, Caûada College, and Skyline College, provide students a two-year education in a variety of vocational technical programs as well as studies that can be transferred to four-year colleges and universities. Over the past few years, the SMCCD has been renovating and updating classrooms on its campuses, adding “smart classroom” technology as well as modernizing the facilities. The smart classrooms include built-in projection equipment and media centers for connection of laptop computers, document cameras, DVD players, and other media. Rooms waiting for renovation are currently using media carts. 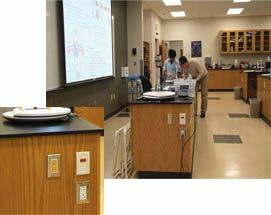 SP Control Pixies in SMCCD classrooms are used for projector, source, and audio control. decided the best solution for easy control of AV equipment would be the installation of control panels to replace handheld remotes. Using these criteria, the ITS team evaluated a number of control systems and selected the SP Controls Pixie for use in the SMCCD complex. “The Pixie met all of those criteria perfectly, and it was inexpensive as well,” Petromilli noted. The SP Controls Pixie fits in a single-gang back box and uses a Decora wall plate for trim. One Pixie can control two or more display devices, providing separate buttons for power, AV sources, and volume up/down. The unit is easily installed and set up— an infrared emitter is placed against the receiver of the projector to ensure accurate commands with each button press on the unit, and the Pixie has the ability to learn the IR commands of a remote through a few simple steps. To further simplify installation in the classrooms, the Pixie units take advantage of the audio output of the projectors in the room. All audio goes into the projector, and audio follows video on the projectors, so when sources are switched, the proper audio comes up with the video. Audio outputs are fed into an amplifier and the Pixie is used to control volume up/down. Between the three campuses in the SMCCD, 179 smart classrooms are currently outfitted with Pixie controllers and others are in the queue for updating. In older rooms, the Pixies are wall mounted with wires running up channels on the walls to the projector; in renovated classrooms, Pixies are mounted on the side of a media center adjacent to connection points for laptop computers.